Please welcome author Keli Gwyn to My Favorite Pastime today. I love her books, and I am sure that you will too! 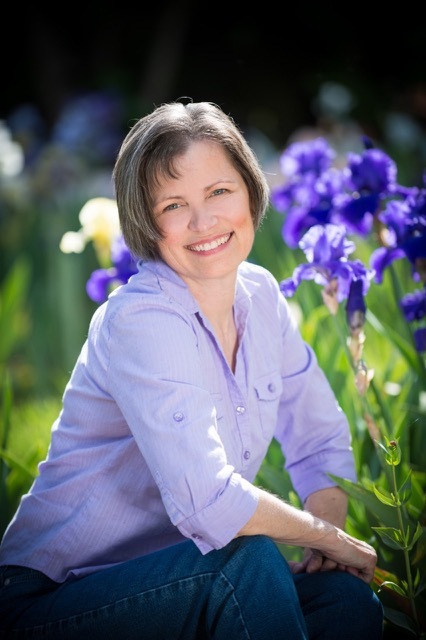 Award-winning author Keli Gwyn writes stories that transport readers to the 1800s, where she brings historic towns to life, peoples them with colorful characters and adds a hint of humor. A California native, she lives in the Gold Rush-era town of Placerville at the foot of the majestic Sierra Nevada Mountains. When Keli’s fingers aren’t hovering over the keyboard of her newfangled laptop, she enjoys strolling past stately Victorian houses in her historic town, burying her nose in reference books as she unearths interesting facts to include in her stories, and interacting with other romance readers. Her favorite places to visit are her fictional worlds, other Gold Rush-era towns and historical museums. She loves hearing from readers and invites you to visit her Victorian-style cyber home at www.keligwyn.com, where you’ll find her contact information. Do you like to sing? I do, but sadly, when it comes to singing, I’m more enthusiastic than talented. My daughter has a lovely singing voice, whereas I make a joyful noise. OK. I’ll confess. I can carry a tune, but I’m not about to try out for our worship team. My singing, for the most part, is limited to blending in with the congregation when we sing praise songs on Sundays and belting out unique ditties for our two kitties in the privacy of our home. The boys don’t my mind my mediocre singing voice or the goofy songs I create solely for their benefit, bless their little cat hearts. Even though I lack the singing voice I’d like to have, I found a way to imagine what it would be like if I did: I created a character who was a singer. 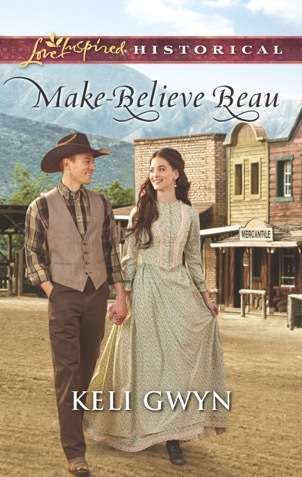 The heroine of my latest Love Inspired Historical, Make-Believe Beau, which releases this month, used to make her living as a singer. She’s an alto, which I am, but unlike me, she can draw crowds with her amazing voice. Jessie’s former singing career plays an important role in the story. She’s working as a draftswoman in a formerly all-male engineering office and is forced into a courtship with her boss, engineer Flynt Kavanaugh. Because of the compromising circumstances surrounding her former career, she’s worked hard to put her past behind her. Flynt finds out that Jessie has a remarkable voice, though, and thanks to his, um, interference, she ends up singing again. Things don’t go as planned, making for some interesting developments in the story. Since I created Jessie, I gave her such a good voice that she’s able to do justice to any type of song. During her unexpected performance in a most unlikely venue, Jessie sings a number of hymns, but she also sings a couple of tunes that were popular during the 1870s. At one point in the story, she even sings a few measures from a famous SOMETHING. As I said, she’s talented. I hope readers enjoy reading Flynt and Jessie’s story and finding out what part her musical abilities play in it. As a draftswoman in a man’s world, Jessica Sinclair causes a stir as her new male colleagues vie for her attention. And the company manager has an ultimatum: fake a courtship with her boss, Flynt Kavanaugh…or lose her job. But pretending to be smitten with the handsome engineer unleashes a real, complicated attraction—and could reveal the past she hoped to keep hidden. Cover art and cover copy text used by arrangement with Harlequin Enterprises Limited. or its affiliated companies, used under license. either in a solo or as part of a group? What types of music are your favorites? Thanks so much for hosting me, Julie. You're such an enthusiastic supporter of authors. It's my pleasure to host you Keli! I do like to sing, I like all kinds of music. I did sing on the praise team once, my nerves got the better of me. I was part of the sign language choir for many years. I prefer to let my hands do the singing. We learned the signs to the songs we were going to perform. Sometimes we would perform with the praise team or other live singer but usually it was to a recording. I did have solo's within the group. My sister can sing like an angel. Andrea, I think it's so cool that your church has a sign language choir and that you've signed to praise songs. I've watched someone sign for a sermon. Her movements were so pretty and so fluid, kind of like ballet for the hands.